The Hermes®90 UAV will be incorporated in the Elbit Systems of America Multimedia Presentation at the AUSA 2009 Annual Meeting and Exposition Booth #4025, Washington Convention Center, Washington D.C.
Haifa, Israel, 29 September, 2009 - Elbit Systems Ltd. (NASDAQ: ESLT) announced today that its Hermes®90 unmanned air vehicle (UAV) system successfully completed its heavy fuel engine (HFE) debut flight. The new engine uses heavy fuel, a safer alternative to automobile gasoline. The heavy fuel is a Kerosene-based diesel fuel (Jp5/8) commonly used in jet aircraft engines. Heavy fuels provides significant advantages in the naval and maritime field, enabling refueling, launch and recovery on naval platforms and ships. 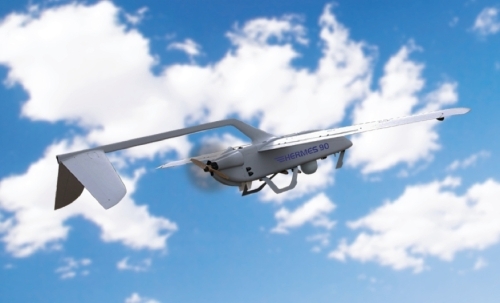 Haim Kellerman, General Manager of Elbit Systems UAV Division, noted that the Hermes®90 HFE flight test marks a significant milestone in Elbit Systems' naval UAV activities. Kellerman added that the Company further plans UAV landing trials on various naval platforms. Among the main features of the Hermes®90: high survivability, over 15 hours endurance, mission range of more than 100 kilometers, varied payloads integration capability and dual launch and recovery methods, including integral launcher for point launch and recovery on non-prepared surfaces without using any dedicated ground equipment, as well as strip operation. The system enables full integration with any C4I system, for fast imagery dissemination as well as easy coordination among the operational forces in the field. Thanks to these capabilities, the Hermes®90 is highly suited for various missions and particularly maneuvering forces, as well as homeland defense and other non-military missions. The Hermes®90 performs day, night and adverse weather missions. The system's compact and lightweight features enable it to be carried onboard two field class vehicles (e.g. Humvee) and to be easily deployed in full cycle operations by a two or three-person crew. The system includes an advanced Ground Control Station (GCS) for monitoring and controlling the mission, mounted onboard one of the field class vehicles. The system's autonomous capabilities together with the simple operating abilities through all of the missions' stages, facilitate optimal deployment, without the need for complex training or special skills. The advanced UAV system (UAS) incorporates highly autonomous capabilities, such as "fly by camera" suitable for various missions and flight modes common to all the Hermes® and Skylark® families of UAS. The basic Hermes®90 configuration includes a Micro CoMPASS™ electro-optic payload, featuring exceptional surveillance performance, which includes a color CCD day camera, 3rd generation cooled thermal imaging and a laser marker. The Micro CoMPASS™ electro-optic payload can also include a laser range finder or a laser designator. In addition to the electro-optic payload, the new Hermes®90 is integratable with other payloads for various operational missions.